This article also appears in India in Transition. The seasonal migrant labor population of India is estimated by some migration scholars to be as high as 100 million. Labor migrants face barriers in accessing social services and settling permanently in urban areas and often prefer to keep their link with the village, especially during the agricultural season. As a result, they “circulate” between their village and various “destination areas” for labor work, spending significant portions of the year away from home. While migration can open new economic possibilities for families, it also comes with high risks. These risks are disproportionately felt by the children of migrants who are often compelled to travel to worksites with their parents. Some have estimated that around six million school-aged children in India participate in family-based labor migration every year. Millions more are impacted indirectly, forced to take on most of the household responsibilities in their parent’s absence. Unfortunately, the Indian administration at the central and state level has not made migrant children a priority and has been negligent and inconsistent in addressing the unique vulnerabilities of such children. Consider the case of the migratory hostel program run by Sarva Shiksha Abhiyan (SSA, “Education for All”), India’s flagship program for universalizing elementary education. The idea is simple but effective: at the request of the local school, students who would otherwise be forced to migrate with their parents are allowed to stay in the primary school building for the six-month migration period. SSA provides for two wardens hired from the community, meals, and some basic supplies. The program is cost-effective because it uses facilities that are already available at the local school. Participants in the program benefit from the positive environment where they can focus on their studies and stay within the safety of their own village. Unfortunately, due to a “change in priorities,” the central government has decided to deny funding to Rajasthan’s eighty migratory hostels for the upcoming year. Closing this program– a small component of SSA’s budget– will have deep repercussions for many vulnerable families in Rajasthan. Evidence from my fieldwork in Southern Rajasthan, as well as a review of social protection strategies for migrants, shows that “source-based” intervention in the areas where migrants originate, like migratory hostels, are needed to prevent child migration and child labor. The urban areas of central Gujarat have long been a popular destination for poor migrants from Scheduled Tribe (ST) communities living to the north and east in the states of Rajasthan, Madhya Pradesh, and Gujarat. Much of the seasonal labor for the brick kiln, construction, cotton ginning, and agricultural industries in Gujarat is sourced from this area. In Southern Rajasthan, many ST families (mostly of the Bhil and Garasia tribe) depend on migration to make ends meet. 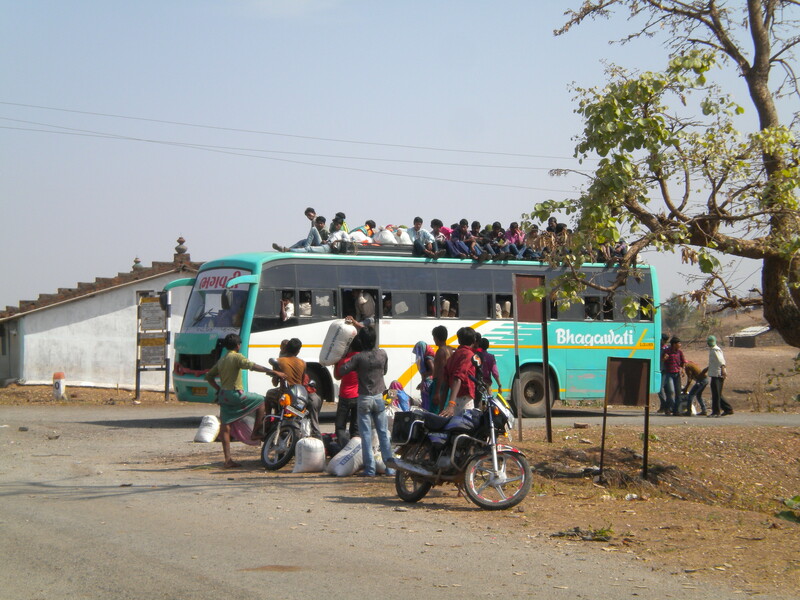 A private bus transports construction laborers to Surat from a remote village in Southern Rajasthan. Due to high poverty levels, female participation in migrant labor is high. A 1997 study on migration in the area led by David Mosse found that 42 percent of the migrant workforce from the Bhil area was female. My survey in villages in Banswara district of Southern Rajasthan found that 75 percent of women and 82 percent of men had migrated to Gujarat for work at least once in their lifetime. While almost all ST families in this area own some land, their landholdings are small and often unproductive, with few having access to irrigation. Massive deforestation in the region has also limited opportunities for these communities which, at one time, were able to sustain their livelihood off of the forest. While some have been able to harness their earnings from migrant labor to move ahead economically, most remain burdened with economic insecurity and indebtedness to local moneylenders. Because most of their income comes from migrant labor, the Mahatma Gandhi National Rural Employment Guarantee Act (MNREGA) program has had little effect on the migration patterns of families in Southern Rajasthan. While 79 percent of adults surveyed reported that they had participated in the program, only a few families said it had impacted their migration behavior; 75 percent of adults who reported they had migrated within the past year had also participated in the MNREGA program at least once. Reliance on migrant labor as a livelihood strategy has major costs to the family. For the most marginalized communities engaged in migration, the whole family must migrate to the worksite because they have no place to leave their children in the home village. The Prayas Centre for Labour Research and Action estimates that there are 840,000 out-of-school children at brick kilns alone. In Banswara, I found that 34 percent of the migrant households had taken at least one child with them to worksites that year. Children can begin helping their parents at the construction worksite from age twelve, but work begins as early as age five in the brick kiln industry, where the piecemeal wage system encourages child labor. Children brought to worksites face the risk of injury, illness, and exploitation, while missing out on educational opportunities that might have helped them escape the cycle of poverty. Various NGOs, many with funding by the American India Foundation (AIF), have piloted educational outreach for children at worksites. Worksites cannot be easily made into education-friendly environments, however, making any benefits from such interventions marginal. Accordingly, AIF, which supports migratory hostel programs for high-migration areas in three states, has shifted its Learning and Migration Program (LAMP) from a dual focus on source and destination areas to one entirely source village-centric. For children left in the village when both parents migrate, most or all of the household responsibilities fall to them. This has led to an increasing incidence of child-headed households in Southern Rajasthan, which was documented recently by Save the Children. In their parent’s absence, children as young as twelve must manage all household responsibilities and care for younger siblings, leaving them little to no time to attend school. For most primary schools in Banswara, attendance dwindles as the academic year progresses, especially after the migration season begins post-Diwali. Many schools I visited had a dropout rate of around 25 percent. Many of Rajasthan 410,957 out-of-school children have exited the school system due to migration pressures. Re-integrating those children into the school system is done through SSA’s “Special Training Programs” (STPs), bridge courses to prepare them academically for entry into the “age appropriate” standard in school. This is a daunting task both for the hired contract teacher and for the students, who may have already been in the workforce for a few years. It is not surprising, therefore, that many STPs fail. During the year I conducted fieldwork in Banswara, over a third of the STPs in the district had to be shut down by SSA. The most successful STPs were the ones with residential facilities like the migratory hostels. Re-integrating students is a challenge. Since migration-induced dropouts account for much of the out-of-school population, particularly in the ST areas, it makes sense to invest in dropout prevention. The migratory hostels, as well as the Kasturba Gandhi Balika Vidhyala (KGBV) program of girls’ residential primary schools, have both proven to be effective in preventing migration-induced dropouts. Expanding both of these programs should be recognized as integral to the government’s strategy for preventing child labor and school dropout. Research across India is beginning to piece together a picture of an increasingly mobile labor class. Addressing the risks faced by this population, especially those risks felt by the children of migrants, must be made a key priority in order for India to meet its development targets. Source-based interventions can protect children from the greatest risks of migration and ensure that no family is forced to remove their children from school due to migratory pressures. Megan Reed is a CASI Research Coordinator. She was a 2012-13 Fulbright-Nehru Student Research Fellow. Categories: India in Transition articles | Tags: education, migrant labor, Scheduled Tribes | Permalink.